World-class trekking and superb scuba-diving for the intrepid traveler. East Timor (Timor-Leste) is in Southeast Asia. It lies northwest of Australia in the Lesser Sunda Islands at the eastern end of the Indonesian archipelago. East Timor includes the eastern half of the island of Timor, the Oecussi (Ambeno) region on the northwest portion of the island of Timor, and the small islands of Atauro and Jaco. While trekking East Timor , you can keep busy by looking for some of the 260 species of birds on offer (the entire Continent of Austrália has some 650 resident species), 32 of which are endemic and 8 of which are exclusive to the island of Timor and found nowhere else in the world. Dive Photo Contest of Timor-Leste. 9-15 October 2010 will see first-class divers and underwater photographers from all over the world participating in East Timor's first ever underwater photo contest. This event is an initiative of President Jose Ramos Horta. There are two major diving companies in Dili Freeflow Diving and Dive Timor-Lorosae. Tais come in different designs and colours, depending on the region they are from, and they represent a distinct family. 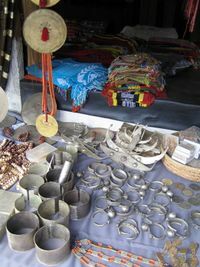 In Dili you should visit the Tais market to buy Tais and local silver jewellery. Tais can also be bought from street vendors. Check out the Immigration Department of Timor Leste, and specifically the link to the Tourist Visa for details on visa requirements, and for details on how to apply for a "visa application authorisation" (which may be obtained via email before you travel), or how to apply for a visa at an Embassy or Consulate should you want to enter at a land border crossing.